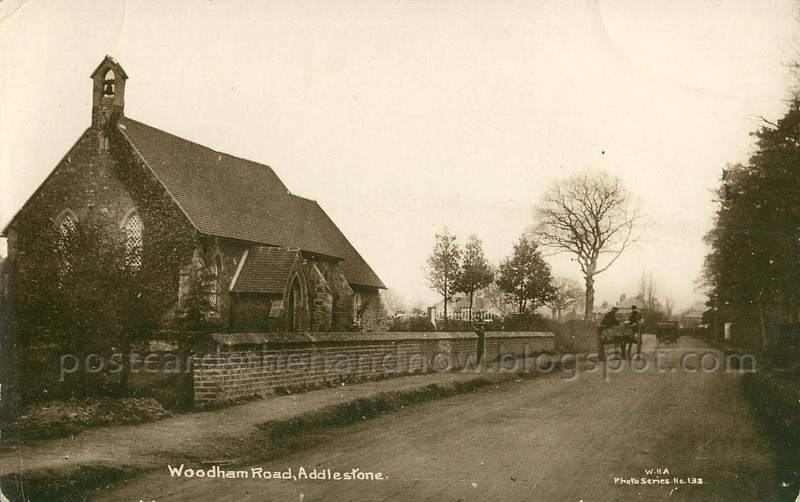 Addlestone, Surrey, Woodham Lane c1912. Unfortunately this area is not so tranquil today. The bridge that you can see in the modern Street View carries the M25 motorway. The church is called All Saints Church. I'm not sure if the road used to be called Woodham Road, or if it is a mistake by the postcard publisher. It is definitely called Woodham Lane today. Strictly speaking it is not Addlestone, it is New Haw. This is an early postcard published by W. H. Applebee of Ashford, Middlesex. At least the trees have grown in. It looks like I have to cross the side street to be able to get across though. I'm sure it's for safety, but as an avid pedestrian I always resent having to walk out of direction so the cars can speed by efficiently. As far as I know it's always been called Woodham Lane. I lived in Addlestone then New Haw Road from 1957 - 1967. All Saints used to double as New Haw School as well till they built a school in Woodham Lane in 1910. That's gone as well now. Marshall Place stands on the old New Haw Middle School site.